Staff photo by C.B. Schmelter / Gov. 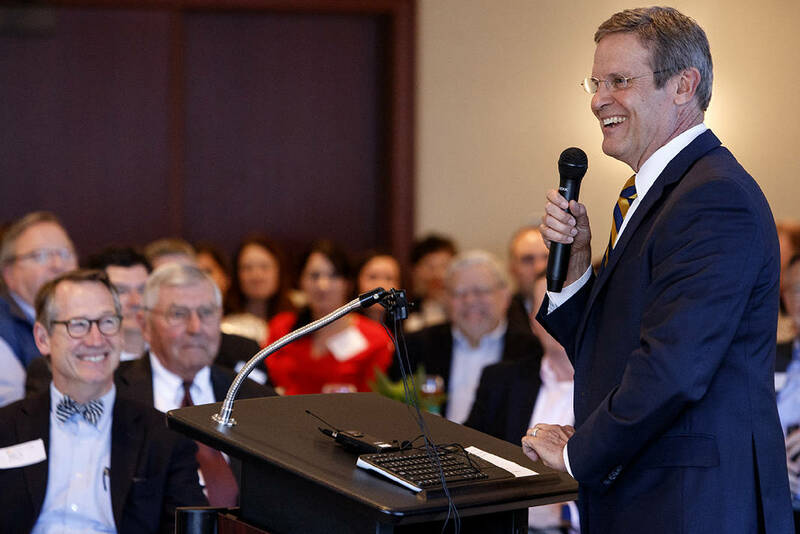 Bill Lee smiles as he speaks at a Chattanooga Area Chamber of Commerce luncheon at the EPB building downtown on Friday, March 22, 2019 in Chattanooga, Tenn. Updated at 5:29 p.m. on Friday, March 22, 2019, with more information. Tennessee Gov. Bill Lee on Friday doubled down on his school voucher proposal, saying there's "a lot of misunderstanding about it" and that passing it is important to Chattanooga. "I encourage you to look deeper," he told a group of about 150 people in Chattanooga. Countering worries that the plan to provide educational savings accounts (ESAs) to parents of students would siphon money from public schools, Lee said his proposal now before the state Legislature would strengthen such funding. When money goes with a child that qualifies for an ESA, those funds are replaced in the school system the student left, the Tennessee Republican said at a meeting organized by the Chattanooga Area Chamber of Commerce. "It provides choice to children and gives Tennessee the opportunity to be a leader in America in improving our schools," said the governor. A new survey of Chattanooga and Hamilton County leaders in Friday's Times Free Press showed a sharp division over the school voucher plan and for granting the state greater authority in approving charter school applications. Members of the Power Poll, which is composed of influential residents here, narrowly oppose both in the most recent survey. For now, the voucher plan would apply to school-age children in the Hamilton, Davidson, Knox, Jackson-Madison and Shelby county school systems, as well as the state-run Achievement School District. If approved by lawmakers, the program would allow lower income parents in poorer performing school districts to use public tax dollars to send their children to private schools or to home-school them. It also would enable parents to use the money to pay for approved education expenses. Parents would receive on average $7,300 to pay for approved expenses including tuition and school supplies. Lee said that enrollment is capped at 5,000 students in the first year, noting that's out of 1 million students statewide. But the plan's enrollment increases by 2,500 the next year if the cap is met. By year five, the number of students could hit 15,000, depending on how many students actually participate. The expected cost to taxpayers is $125 million in its first five years. Beginning in year six, the program could increase by 1,000 students annually. "This is an opportunity to find best practices through this pilot plan," Lee said. Meanwhile, the governor also said that a host of criminal justice reforms he's offering around re-entry to society will reduce recidivism and crime and create safer neighborhoods. "For violent criminals and those who are a threat to our society, justice should be swift and severe," he said. "We also can be very smart in how we approach criminal justice. We can be tough on crime and smart on crime at the same time." Ezzard Robinson, a community organizer, asked if Lee's reform programs will train people how to receive a person who has been though a re-entry program and who is coming into the workforce to not be seen as being different. Lee said a re-entry program with which he worked had a workforce development component and partnerships with companies. "I'm talking with the corrections commissioner to expand opportunities for those in prison to gain skills and to expand partnerships with companies outside of prison so when they come out, they can utilize that skill and get a job," the governor said. "We have to find those employers who understand that this is a pipeline of workforce development for them and develop these partnerships." When there's a successful re-entry from prison, that's one less $28,000-a-year bill taxpayers are footing to incarcerate someone, he said.